Before we roll out Lightning Experience for our end users and start building apps, let’s take some time to get familiar with the Lightning Experience interface and define user access. In the Lightning Experience Transition Assistant, which is available in Setup, you can find tools to help you. These tools include learning trails, feature comparison charts, and ways to preview your customizations in Lightning Experience. In addition, there are tools on how to enable key Lightning Experience features like Notes and News and how to enable Lightning Experience itself. In this step we review the Transition Assistant in our DE. 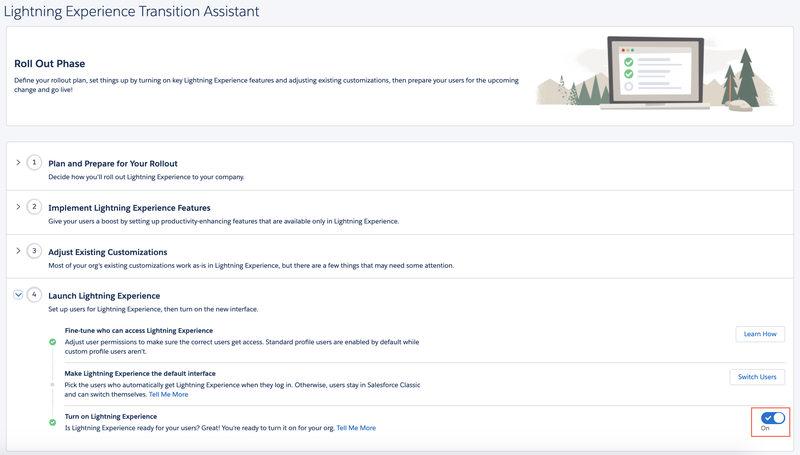 But you can use all of these tools in your production Salesforce org to learn more about what your features and customizations will look like in Lightning Experience. The parts of the Transition Assistant we will be highlighting in this project are the Preview tool and the Readiness Check. The Preview tool lets you see your apps in Lightning Experience before you actually enable it. The Readiness Check provides you with a Readiness Report. This report includes an itemized list of the features you use and customizations you’ve created. In additions, get explanations about how they are supported in Lightning Experience and if you need to do some additional review. Let’s take some time to learn about Lightning Experience, define Lightning Experience access for users, and enable Lightning Experience for your org. The Trailhead Playground will default to Lightning Experience, but let's switch it back to Classic so we can get a true understanding of transitioning from Classic to Lightning. Click the profile icon (picture of Astro) in the upper right. It’s super easy to preview what your org will look like in Lightning Experience using the Preview tool. In the header, click Setup. Under Lightning Experience Transition Assistant, click Get Started. 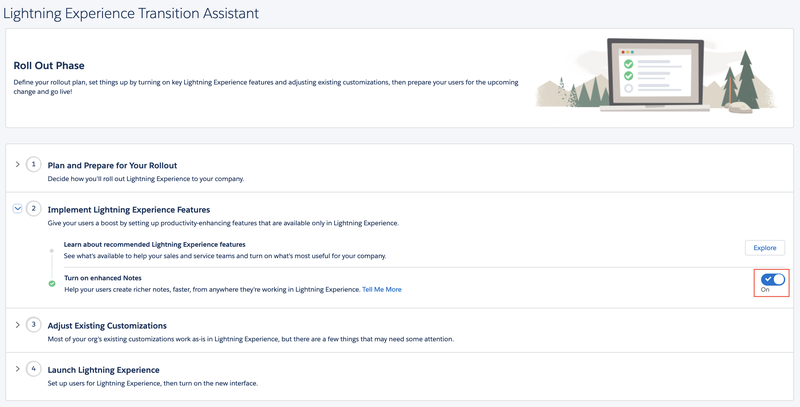 Notice the three phases of the Lightning Experience Transition Assistant. Click around and view the various resources available to you. 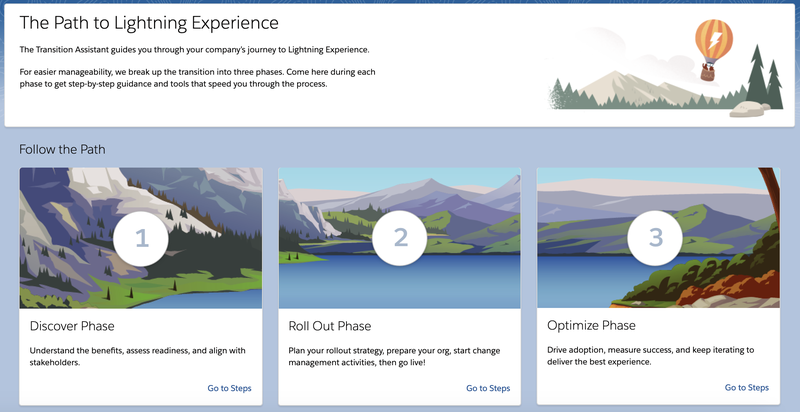 After viewing the resources in each phase, return to The Path to Lightning Experience page. Click Go to Steps under the Discover Phase. Click Step 2: Evaluate Lightning Experience Benefits and Readiness. Click around your environment in Lightning Experience. Use this preview to see what your Salesforce apps looks like in Lightning Experience. Click the Opportunities in the navigation bar. Select the All Opportunities list view, then click Burlington Textiles Weaving Plant Generator to open that opportunity. Click around the opportunity page a bit to explore the look and feel of Lightning Experience. For example, use the Path to change the Opportunity Stage to Value Proposition. Click Exit and Return to the Transition Assistant. The Lightning Experience Readiness Report helps admins learn more about what to consider before they turn on Lightning Experience. In addition, based upon what functionality your org currently uses, the Readiness Report contains recommendations on what to do next. While the Lightning Experience Readiness Report doesn’t identify all of the unsupported features and customizations in Lightning Experience, it helps give you a sense of how ready your org is to transition. From Setup, in the Lightning Experience Transition Assistant, click Go to Steps under the Discover Phase. Click Check Readiness. If necessary, click Allow on the pop-up. Click Sales Cloud, then Check Readiness, and then close the window. Feel free to watch the Tips for Migrating to Lightning Experience video while you wait for your report to complete. When you receive the readiness report email, open it and review how difference features are highlighted. It can take a few minutes for the report to appear in your inbox. If you don’t see it, try searching your email for “readiness.” In the meantime, feel free to watch Tips for Migrating to Lightning Experience while you wait for your report to complete. Now that we’ve explored the Lightning Experience look and feel, let’s go ahead and turn on Lightning Experience, grant access to specific users with a custom permission set and enable Lightning Experience for our environment. You likely want to do an initial rollout of Lightning Experience to a subset of your users. Therefore, it’s best practice to grant access to Lightning Experience through either a profile or permission set. All standard profiles have the Lightning Experience User permission enabled by default, so our users are already assigned to a custom profile (Dreamhouse User). We’ll create a new permission set for access to Lightning Experience and assign it to our users. From Setup, enter Permission Sets in the Quick Find box and select Permission Sets. Next, we’ll add the Lightning Experience User permission to this permission set. Scroll to the System section and click System Permissions. Check the Lightning Experience User box. Now that you’ve created a Permission set, this is a good time to review who will have access to Lightning Experience when you enable it. From Setup, enter Users in the Quick Find box and select Users (under Manage Users). Click the user record for Randy Realtor. Your end user, Randy Realtor, has the Dreamhouse User custom profile assigned. Take a look at the profile and check if it has Lightning Experience enabled. From Randy’s user record, click the Dreamhouse User profile link. Scroll to the Administrative Permissions section and notice that Lightning Experience User is not checked. This means that when you enable Lightning Experience for your org, Randy won’t be able to use Lightning Experience. Unless, of course, you change his profile or add him to a permission set that has Lightning Experience permission enabled. Randy is part of our initial rollout of Lightning Experience, so we want to give him access to it, without modifying his custom profile. When we assign him our new permission set, it will layer on top of his existing profile and grant him access to Lightning Edition. Scroll to Permission Set Assignments and click Edit Assignments. Move the Lightning Experience User permission set to the Enabled Permission Sets column. Now that you have reviewed and granted access to Lightning Experience, it’s time to enable Lightning Experience and some related features. From Setup, under Lightning Experience Transition Assistant, click Get Started. Click Go to Steps under the Roll Out Phase. Click Step 2: Implement Lightning Experience Features. Toggle Turn on enhanced Notes to On. Click Step 4: Launch Lightning Experience. Ensure Turn on Lightning Experience is toggled to On. Click Finish Enabling Lightning Experience (this step may already have been done for you). Your org is now Lightning Experience enabled!